George Town is a funny little place and every cruiser has an opinion about it. Some folks leave home and buzz on down to G-Town for the whole entire winter. No Land and Sea Park, no piggies at Staniel, no laundry at Black Point, they just head for G-Town. Others refuse to even enter the harbor because they don’t “do” organized cruising. And some of us are intrigued and insist on forming our own opinion of the place. George Town has been accurately described as “day camp for adults.” During peak season, each day is jam packed with organized activities, pot lucks, and informal get-togethers at Volleyball Beach all outlined clearly during the structured Cruiser’s Net every morning at 8 am on channel 72. As a teacher, George Town feels strangely like a culminating activity after a long, intense unit in cruising. When we finally made it to George Town, peak season was over. So although we did make it to a few of the organized activities, they dwindled quickly. We really enjoyed our time in George Town. If we wanted to be near town, Kidd’s Cove was super convenient. If we wanted to be social, we could head to Volleyball Beach. If we wanted to be on our own or wanted better protection from cold fronts, Red Shanks was right around the corner. If we wanted to beach and hike, Monument or Sand Dollar was the place to be. We reunited with friends we had met all over the east coast and down the Exumas, and shared stories of familiar places. We also met lots of new friends because you run into cruisers everywhere! Freediving class given by a world record-holding chic (and really nice young cruisers)! It’s a good place for having visitors! Eddie’s Edgewater has great wi-fi and a fun dancin’ time at the Rake and Scrape on Monday night! Chat ‘N Chill’s cole slaw is delicious. Fish Fry Village was pretty poppin’ and the food was yummy. There are resorts scattered around if you want a resort day or a fancier restaurant. The beach walking on the ocean side is incredible. Good snorkeling spots spread out around the harbor! You know you’re in George Town when you see this sign! At Chat ‘N Chill on Stocking Island. The ocean view from the end of one of the many trails on Stocking Island! A beautiful tree swing at the beach! Monument Beach anchorage at sunset. Can you find Journey?! Me paddling to yoga! Can you imagine? Paddling every morning to free yoga. I was in HEAVEN! Me floating around Monument anchorage. The prize at the end of Nev’s Trail on Stocking Island. A beautiful mural at the Batelco store. Playing with my fisheye lens at the beach! The view from one of the trails on Stocking Island. 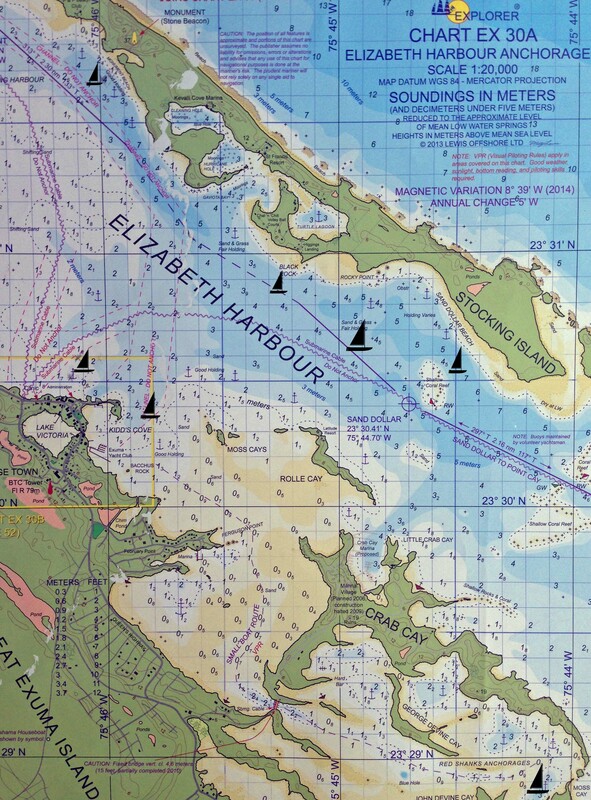 Elizabeth Harbor is on the left, Exuma Sound is on the right. Me and JR at the top of Monument Beach. On one of the many marked trails on Stocking Island. From left to right: me, Natalie, JR, Mitchell, Scott, and Kim chilling on Sea Major for the evening! Photo courtesy of Natalie! JR at the fish fry! Time for a haircut, maybe? ‘Bout to give Jake a haircut in the cockpit! There were the sweetest little, tiny shells on the ocean side. We became addicted to finding and collecting them! The line for a propane tank refill! Can you spot JR? The dinghy dock maintained by the Exuma Market. Yup, this is how we bathe! The dinghy ride can be long and sometimes WET! Remember these folks?! Sea Major! Boo Kitty napping with his favorite napping buddy: Explorer Charts! Be sure to look up Tom and Amy on the catamaran Dream Catcher. They have a boat full of weasels. he was doing the net for awhile bu not sure if he still is. Love all the photos and extra descriptive update! Posts like this one, found on other blogs, are great inspiration for getting through a long Minnesota winter. Ahoy!! My name is Gordon on the trawler Blue Heavens. Last year I was helping some of the local students with their reading at George Town PS, and had lots of volunteers come to help during the cruising season. We monitor ch. 68 if anyone is coming to GT and would like to volunteer!! There is also a need for school supplies (writing tablets for K & 1, markers, notebooks, paper, etc), so please bring some if you’re coming! Oh, I would also like to get play blocks for K and a paint easel and supplies. My email is : gordonwjeffries@yahoo.com, our Bahamas phone # is 242 554 5351. Thank you!! Oh, also books!! If you can bring current kid’s books, the kids will eat them up! Family Island Book Initiative is on FB and can help with shipping, etc and what supplies are currently needed.